The partisan gap on the second question is predictably large. 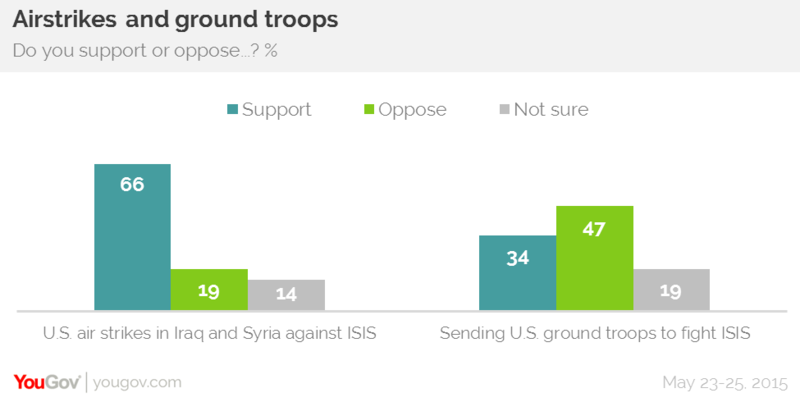 Almost half (48%) of Republicans support sending grounds troops against ISIS, while just a quarter of Democrats support the same. Air strikes are popular across party lines despite the fact that they are obviously not sufficient to prevent ISIS from making additional gains. Despite what some hawks claim, the public is not clamoring for sending Americans into a new ground war. There continues to be substantial opposition to escalating U.S. involvement in the war. The question is somewhat misleading. It pretends that there were ever “moderate groups” to be armed, and it creates the impression that “moderate groups” in Syria would be using these weapons to fight ISIS rather than regime forces. 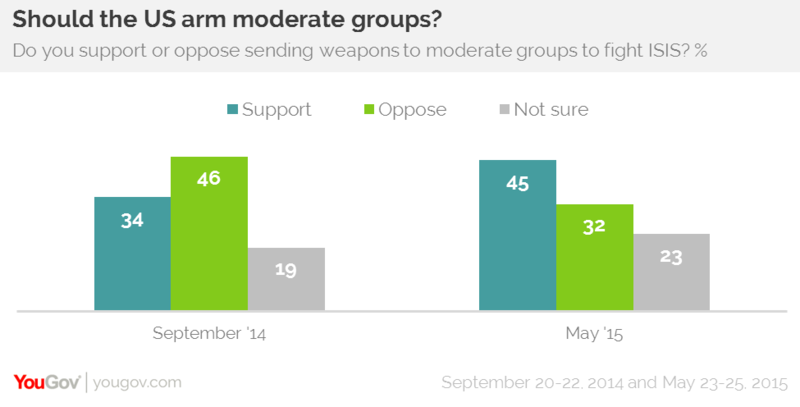 If respondents were asked, “Should the U.S. provide rebels with arms that will shortly end up in the hands of jihadist groups?” I suspect that the result would look very different. There were two more interesting results that were not mentioned in the write-up. One was the response to a question about which side in the Syrian civil war the U.S. should take. 11% said the U.S. should back the government, and 14% favored anti-regime rebels. 43% wanted the U.S. to take neither side. There is vanishingly little public support for Syrian rebels overall, and this holds true regardless of party, region, income, or education. Very few Americans share the Syria hawks’ enthusiasm for that cause. Accordingly, a similar percentage believes that the U.S. should never have become involved in the Syrian conflict (44%) while just 24% agree that the U.S. should have become more deeply involved sooner. The default Republican hawkish position among presidential candidates has the backing of less than a third of Republicans (32%). Posted in foreign policy, politics. Tagged Syria, Iraq, YouGov, ISIS. The default Republican hawkish position among presidential candidates has the backing of less than a third of Republicans (32%). All the more reason to suspect that “the default Republican hawkish position” is driven by corruption. Bribes. In other words, Republican voters aren’t demanding or even supporting these hawkish policies. Instead, Republican politicians are being paid by foreign interests (representing Israel and other client states), arms merchants, and others who profit from fostering fear and keeping the wars going. Republicans must stop tolerating (and electing) the McCains, Grahams, and Cottons and start working to get rid of them. Until that happens they will continue to represent foreigners and global commercial interests instead of flesh-and-blood American Republicans. The public doesn’t have a dried-up cat turd’s worth of understanding about Syria. Can’t blame them, because it has little to do with Americans’ lives so long as we stay out. excuse my providing the following attribution for Congressional cessation of fund for milops. Pat Buchanan makes an excellent point in this magazine: the so-called “moderates” in Syria have no popular support. Pat seems to think that only Islamists have any popular legitimacy or appeal, which is patently false. There is a seizable secular and anti-Islamist political base in Syria; it supports Bashar Al Assad and is opposed by the US. If the US were serious about fighting Islamist nihilists, it would help Assad against the insurgency. I continue to be skeptical on the validity and usefulness of these polls. So this is far from getting a random sample from the actual US population. It is self-appointed sample with no verification of who actually registered and their background. McCaine and Graham could have had their staffers make 100 ghost accounts on YouGov for all we know. It is also well known that response rates are getting harder by phone. i think I made two errors in posting one on the dates and this oe — which was to the AUMF article, . There was no intention to deceive. (1) 81% of Americans answer either that ISIS in Iraq poses “an immediate and serious” threat (57%) or a “somewhat serious” threat (24%) to the US. (2) 80% of Americans answer either that ISIS in Syria poses “an immediate and serious” threat (55%) or a “somewhat serious” threat (25%) to the US. ISIS (whether in Iraq or Syria) poses no serious threat to the US. Not an “immediate and serious” threat. Not a “somewhat serious” threat. No serious threat at all! The US should stop bombing ISIS, withdraw American troops, and let the combatants and nations of the region sort this mess out. Americans have no dog in this fight. Let’s save American lives, American money, and American prestige for a fight that involves our actual national interest – a fight that means something. What war on ISIS? All America ever does is gift them military hardware via the repeated “Abandoned Iraqi equipment” mockery! At the risk of sounding immature, or worse, neoconservative, I say we should go kick their asses. We could do that. I would like you to describe what means. And what we should expect the benefit to be.